This post is brought to you by Finlandia. All opinions are our own. The holidays are among us! The decorations are coming out, the festive music is already playing and we’re starting to feel the joy! Two of my favorite things about the holidays are seeing all the beautiful shiny light displays everywhere I go and, of course, the wonderful food! I don’t know about you, but my cooking is always best around the holidays. 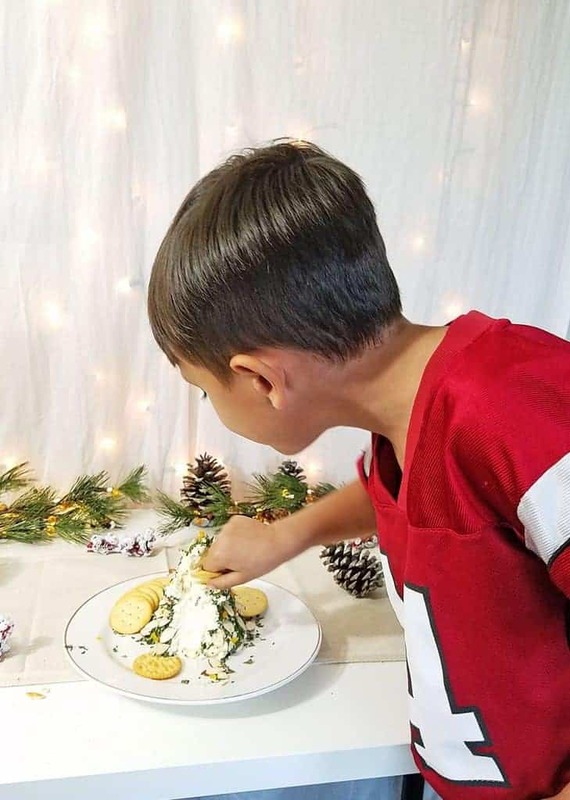 My culinary skills magically improve and I can make beautiful masterpieces that are devoured, like today’s holiday tree cheese ball recipe made with creamy, delicious Finlandia™ Creamy Gourmet Cheese! 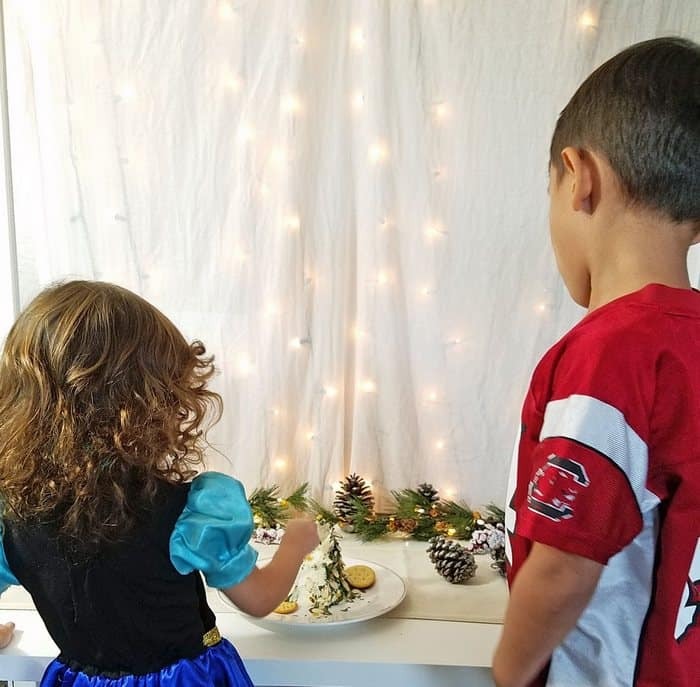 During holiday parties, the guests get a little restless waiting to experience those magical cooking skills! I don’t want to leave them feeling hungry while they wait for dinner to be served. Fortunately, I’ve come up with the perfect solution: tasty appetizers that are easy to make so that your energy can go into the main course. Today we are bringing you a deliciously festive holiday tree-shaped cheese ball that not only looks beautiful but tastes amazing. It will look like you made it painstaking love, and no one will know that it took very little effort. 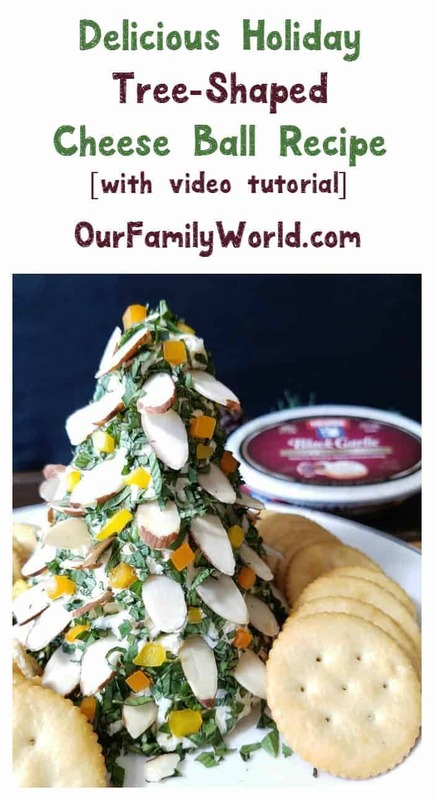 Even the youngest of your holiday guests will love this tree-shaped cheese ball! To make this cheese ball we used Finlandia’s Black Garlic cheese. This cheese is loaded with flavor! We mixed the black garlic cheese with cream cheese and finely shredded cheese. To make the tree green we chose fresh basil. It gave the perfect herb balance to Finlandia’s black garlic cheese. To shape the tree, we rolled a piece of newspaper into a cylinder and lined it with plastic wrap before filling with cheese mixture. Check out the video, then print the recipe card for later! Do you have a favorite recipe using Finlandia Creamy Gourmet Cheese? Share in the comments! In a large bowl combine cream cheese, Italian blend cheese, and Finlandia cheese. Form a sheet of newspaper into a cone. Line the inside of the cone with plastic wrap. The plastic wrap will hang out the end. This is ok because it will cover the bottom of the cheese ball. Scoop cheese mix into the cone. 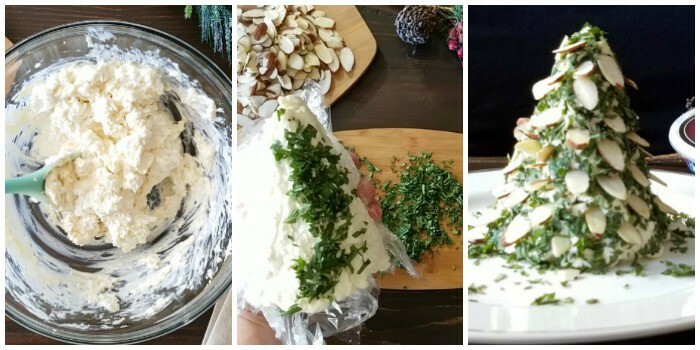 Fold plastic wrap over the end of the cheese ball. Place cheese cone upside down in a cup or mug and refrigerate for at least 2 hours. Remove cheese ball from the cone and gently roll in the chopped basil. 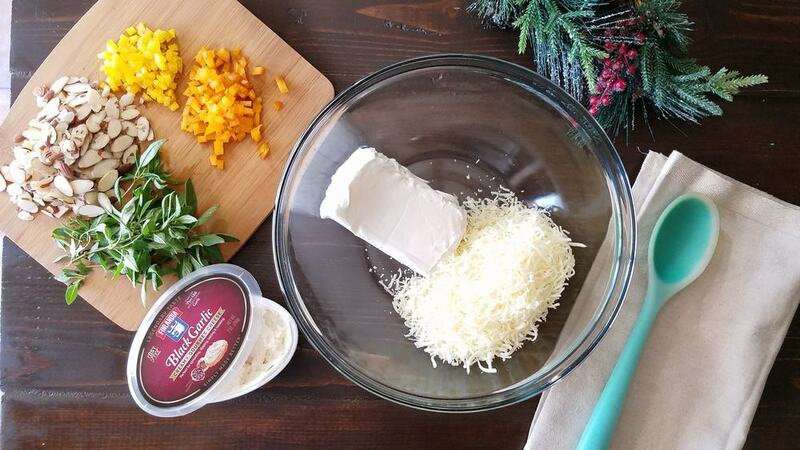 Lightly press almonds and bell peppers into the cheese ball to decorate. The almonds look light white lights, and the bell peppers look like ornaments. Keep refrigerated until ready to serve. Serve with crackers or fresh vegetables. Once the cheese tree is decorated you can store it in the refrigerator until ready to serve. Unlike most cheese ball recipe, you really do not need to let the cheese tree soften a lot before serving. Finlandia’s cheese is soft and smooth. It holds its shape but doesn’t get hard as a rock in the refrigerator. We served our cheese tree with crackers, but it would be fantastic with fresh vegetables as well. Instead of setting out a veggie platter with dip, try a veggie platter with a beautiful and delicious cheese tree in the center. Talk about wow factor! Finlandia is hosting Influencer Recipe Contest on their Facebook page featuring 25 influencer recipes – including ours! We’d love for you to vote for us! There’s even something in it for you! One lucky voter will be picked to win a $1,000 Visa gift card! Earlier this month, we also shared an easy everyday raspberry compound butter recipe using Finlandia imported butter, so be sure to check that out! Find even more recipe inspiration on Finlandia’s Pinterest, Twitter and Instagram pages. Don’t forget to vote in the Facebook contest! Is It Normal to Lose Weight During the 2nd Trimester of Pregnancy? I love anything with cheese lol. This is almost too pretty to eat. This is so beautiful! I will feel guilty eating it! I think it’s an awesome idea and it’s perfect for the Holidays! I’m sure your guests will be at awe when they see this! Now this is seriously festive and uber creative. I love it but I would hate to destroy it and eat it! That looks so cute and yummy! I almost wouldn’t want to break it down to eat. I love this recipe and how you’ve created a a work of art that is seriously gorgeous and edible! Definitely going to try and recreate your greatness for my holiday party! This is such a cute idea! I would love to make this as an appetizer for our holiday dinner. This looks fun-tastic! It will surely be a huge hit at any party! That is absolutely beautiful. It would be fantastic for a party. Wow, very creative, festive, and looks so yummy! Thanks very much for the inspiration! Oh this is just so impressive! I can see it being a huge hit for a party. The almonds work so well! What a stunning holiday recipe idea. Anything involving cheese is always a hit around here! This has a very nice presentation about it. I am glad you included an instructional video for its preparation. A great idea for something to bring for our family potluck that we do each year. I am pinning this so I have it. Thanks! This looks really good! Who doesn’t love a holiday cheeseball? They are one of my favorite appetizers for holiday parties. This will be sure to brighten up my appetizer table on Christmas eve. I love serving different kinds of cheeses and i know even the kids will love this one. That is 100% awesome. I love that you made the cheese ball into such an interesting, festive shape. Very cool! I have never tried this cheese but I would love to try it. I have had a new love for cheese lately and this would make the perfect appetizer for out Christmas party this year. It really is so cute! Oh wow I am in awe right not just staring and salivating at these cheese ball recipe. Mmm, this looks delicious! Gonna have to try to make this! This sounds so delicious, I love the way it is so festive, yet so simple it can be made ahead of time or last minute. I love that it can be versitile using what herbs you have or favor. It looks soooo good! I’ve added to the must make for my upcoming party! That looks great! What a wonderful idea. I may need to make one of these now. I’m sure this would be gone quick in my family. That is cool looking. We always make ranch cheese balls. It always is a family favorite and disappears quickly. That looks PERFECT for a Christmas dinner!! And it looks super tasty too!! I love this for the Holidays. I will have to get the ingredients I need to make one for our Christmas party. I’ve never tried their cheese before but it looks so creamy. Love your holiday tree idea. Super perfect for holiday parties. This Finlandia Holiday Tree Cheese Ball recipe is a great idea for the holidays. I have never made a cheese ball before because I don’t like cream cheese but this recipe I may do because it looks amazing. Thanks for sharing the recipe. That is not a cheese ball that is a work of art! How beautiful!! That would be great to serve at any holiday party! What a wonderful idea! That looks so delicious. Looks like everyone enjoyed it to the last bite! I will have to try this recipe! That is so cool! I always love to take classic party dishes and do a new decorative twist on them. You just won the internet! Anyone can make a cheese ball. It’s a ball. I LOVE the creativity behind this. It looks just like a tree. That holiday tree cheese call looks super delicious and cool. Thanks for sharing with us…gonna try it out for sure! What a fun way to make the cheese ball. This looks and sounds really good! Pinning it. Oh my goodness this is such a great idea!!! I always make a football shaped cheese ball for Superbowl, I’m not sure why I never thought of this!! It’s genius! I can’t wait to try it out – yours looks beautiful! Oh my gosh, so cute. I love the twist on the traditional cheese ball. Sounds like a yummy recipe. That is so cute! I will have to try that, it looks amazing. Can this be any more festive! I love the concept and I love how it looks as well. It’s perfect for appetizers especially when you’re hosting the party!